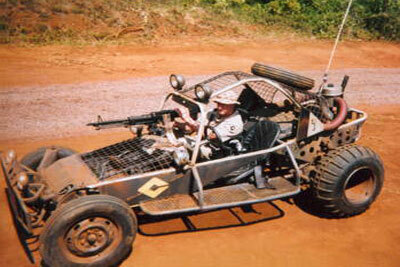 Paul Edney in "The Rundown"
as an armed dune buggy driver. 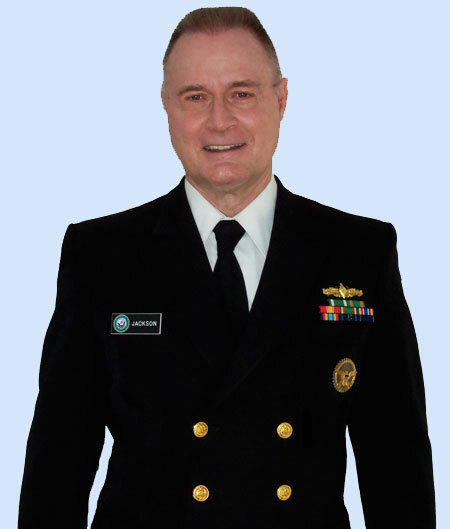 as a U.S. Navy Captain. as a WWII U.S. Marine. as a Poker Tournament Pit Boss. This online Resume is a generalized one intended mostly for friends and family. Casting Directors may request my professional resume from me here. The Circle. Laundry Worker. Director James Ponsoldt. Playtone. Jason Bourne. Las Vegas Cab Driver. Director Paul Greengrass. Universal Pictures. Hollywood Adventures. Redneck Biker. Director Tim Kendall. Siren Studios. Aloha. USAF Family Member. Director Cameron Crowe. Columbia Pictures. Godzilla. Tsunami Survivor. Director Gareth Edwards. Warner Brothers. 100 Kai Nakukoto (To Cry a 100 Times). Bus Passenger. Director Ryuichi Hiroki. U International. The Descendants. Bicyclist. Director Alexander Payne. Fox Searchlight Pictures. Atlas Shrugged. Bicyclist. Director Paul Johansson. The Strike Productions. You May Not Kiss The Bride. Chicago Restaurant Patron. Director Rob Hedden. Hawaii Film Partners. Into The Blue 2: The Reef. Hospital Patient & Stand-In for Chris Carmack. Director Stephen Herek. MGM/Mar-Vista. My Sister's Keeper. Funeral Mourner. Director Nick Cassavetes. New Line Cinema. Drag Me to Hell. Bank Customer. Director Sam Raimi. Universal Pictures. The Soloist. Driver. Director Joe Wright. Dreamworks Pictures. The Comebacks. Football Fan. Director Tom Brady. Twentieth Century Fox. Repo. Diner Patron. Director Kern Konwiser. Konwiser Brothers. Ocean's Thirteen. Las Vegas Tourist. Director Steven Soderbergh, Warner Brothers Studios. Pandemic. Airport Police Officer. Director Armand Mastroianni. Mirabow Productions. Half Past Dead 2. Prison Guard. Director Art Camacho. Sony Pictures Entertainment. The Grand. Poker Tournament Pit Boss. Director Zak Penn. Insomnia Media Group. Beerfest. Munich Oktoberfest Singer. Director Jay Chandrasekhar. Warner Brothers Studios. Take. Waffle House Patron. Director Charles Oliver. Whitelight Entertainment. Balls of Fury. German Skinhead. Director R. Ben Garant. Spyglass Entertainment. You, Me and Dupree. Airline Passenger. Director Anthony Russo & Joe Russo. Universal Studios. Redline. Car Racing Team Pit Crewman. Director Andy Cheng. Chicago Pictures. Spider-Man 3. New York City Commuter/Driver. Director Sam Raimi. Columbia Pictures. Reno 911 ! : Miami (the movie). HAZMAT Squad Member. Director R. Ben Garant. 20th Century Fox. The Good German. 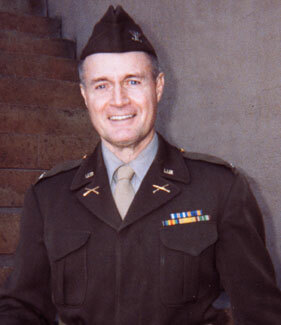 WWII U.S. Army Officer. Director Steven Soderbergh. Warner Brothers Studios. Mission Impossible III. 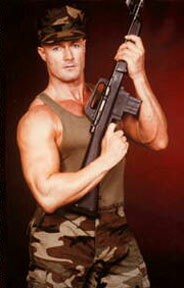 Armed IMF Agent (Featured). Director J. J. Abrams. Paramount Pictures. Lucky You. Las Vegas Casino Patron. Director Curtis Hanson. Warner Brothers Studios. The Shaggy Dog (2006). Courtroom Bailiff (Featured). Director Brian Robbins. Disney Studios. Fifty First Dates. Seaplane Pilot. Director Peter Segal. Columbia Pictures. The Rundown. Armed Security Guard/Dune Buggy Driver. Director Peter Berg. Universal Studios. Blue Crush. Beach Goer. Director John Stockwell. Universal Studios. Windtalkers. WWII U.S. Marine. Director John Woo. MGM Studios. ** = Not released yet. Veronica Mars. Hotel Guest. Season 1, Episode 3. Director Joaquin Sedillo. Warner Brothers TV. The Politician. Motel Guest. Season 1, Episode 6. Director Gwyneth Horder-Payton. Netflix. Dead To Me. Man Watering Garden. Season 1, Episode 1 (Pilot). Director Amy Ruben. Netflix. Lucifer. Museum Visitor. Season 4, Episode 5. Director Viet Nguyen. Warner Brothers TV. The Ranch. Cattle Auction Goer. Season 4, Episode 2. Director David Trainer. Netflix. The Rookie. Studio Executive. Season 1, Episode 7. Director Adam Davidson. ABC TV. Runaways. School Teacher. Season 2, Episode 4. Director Patrick Norris. HULU. Silicon Valley. Techie Camper. Season 5, Episode 8. Director Alec Berg. HBO. Animal Kingdom. Beach Goer. Season 2, Episode 9. Director Larry Tang. TNT. The Ranch. Cattle Auction Goer. Season 2, Episode 4. "She'll have you back". Director David Trainer. Netflix. PrettyLittle Liars. 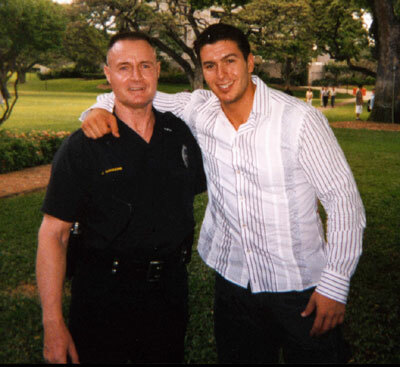 Off-Duty Policeman. Season 7, Episode 19. "Farewell My Lovely". Director Joseph Dougherty. ABC TV. NCIS. US Navy Family Member. Season 14, Episode 4. "Love Boat". Director Terrence O'Hara. CBS Television. Goliath. Pedestrian. Season 1, Episode 5. Director Anthony Hemingway. Amazon Studios. Westworld. Robot. Season 1, Episode 4. Director Vincenzo Natali. HBO. Westworld. Robot. Season 1, Episode 5. Director Richard Lewis. HBO. Westworld. Host. Season 1, Episode 6. Director Vincenzo Natali. HBO. Westworld. Robot. Season 1, Episode 7. Director Stephen Williams. HBO. Pitch. Baseball Umpire. Director Paris Barclay. 20th Century Fox Television. Veep. 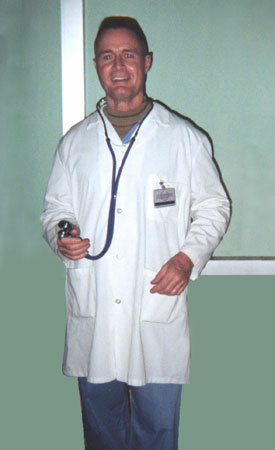 US Navy Doctor. Season 5, Episode 5. Director Alex Gregory. HBO. American Crime Story. Courtroom Bailiff. People v. O. J. Simpson, Season 1, Episode 9. Director Anthony Hemingway. FX. The Fosters. Motel Guest. Season 2, Episode 20. "Not That Kind of Girl". Director Lee Rose. ABC TV. Baby Daddy. Neighbor with Parrot. Season 3, Episode 5. "Life's A Beach". Director Michael Lembeck. ABC TV. Hawaii Five-O. Bank customer. Season 4, Episode 2. Director Joe Dante. CBS TV. Spy. 4-star U.S. Air Force General. Pilot. Director Alex Hardcastle. Disney Channel. Last Resort. U.S. Navy Lieutenant. Pilot. Director Martin Campbell. ABC TV. Good Luck Charlie. Barber Shop Customer. Season 3, Episode 2. "Bad Luck Teddy". 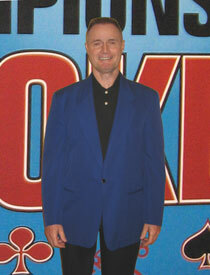 Director Bob Koherr. Disney Channel. The River. Surgeon. Season 1, Episode 7. "The Experiment". Director Ken Fink. ABC TV. Justified. Coal Miner. Season 2, Episode 3. Director Peter Werner. FX Network. Justified. Coal Miner. Season 2, Episode 2. "The Life Inside." Director John Avnet. FX Network. Hawaii Five-O. Security Agent. Season 1, Episode 8. "Po'ipu." Director Brad Turner. CBS TV. Hawaii Five-O. U.S. Air Force Sergeant. Season 1, Episode 2. "Ohana." Director Brad Turner. CBS TV. Terriers. Car Driver. Director Adam Arkin. Fox TV. Amish Grace. News Cameraman. Director Gregg Champion. Lifestyle. Generation Gap. July 4 Partygoer. Director Bill L. Norton. CBS TV. Zip (pilot). Russian Driver. NBC TV. Jericho. Outdoor Market Shopper. CBS TV. Close to Home. Detective. CBS TV. Entourage. Upscale Cocktail Party Guest. HBO. Grey's Anatomy. Hospital Patient. ABC TV. Medium. Attorney in Phoenix Arizona DA's Office. NBC TV. E-Ring. Pentagon Civilian Employee. NBC TV. Invasion. U.S. Air Force Sergeant. ABC TV. Numb3rs. U.S. Army Soldier. CBS TV. Homewrecker. Sauna Patron (Featured). MTV. Huff. Karaoke Bar Patron (Featured). SHOWTIME. Crossing Jordan. 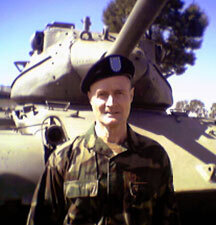 U.S. Army Sergeant. NBC TV. Free Ride. Doctor. Fox TV. Without A Trace. New Jersey State Trooper (Featured). CBS TV. Barber Shop (the TV series). Chicago Barber/Stand-In for Wes Chatham. SHOWTIME. Lost (series). Australian Cop. ABC TV. Koi ni Ochitara (When I Fall in Love). Hawaii Hotel Poolside Waiter. Fuji TV, Japan. Medical Investigation. Doctor (Featured). NBC TV. Eyes. 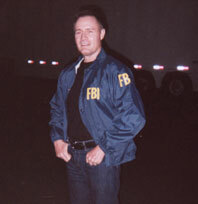 FBI Agent. ABC TV. Tides of War (aka The Phantom Below). U.S. Navy Officer (Featured)/Stand-In for Kent McCord. HERE! TV. 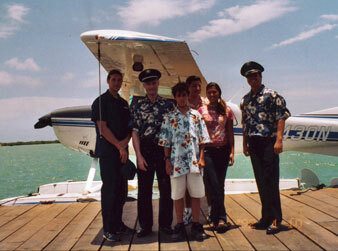 Lost (pilot episodes 1 & 2). Airplane Crash Survivor. Director J. J. Abrams. ABC TV. North Shore. Hotel Guest. FOX TV. Hawaii. Cop/Detective (Featured). NBC TV. My Wife & Kids. Luau Guest. ABC TV. Genuine English accent, Australian accent, French language, Stand-in, Stage Combat, Stunts, Weapons training, Running, Cycling, Beach sports, Football, Hiking, Driving (manual), Red Cross: First Aid & AED/CPR (Professional Rescuer). Height: 6'0", Weight 200 lbs, Hat 7.5, Shirt 17"/33", Coat 44L, Waist 36", Inseam 31", Shoe 10.5. Short light brown hair (crew cut), Blue eyes. Lean muscular body type. Physically fit. I can legally work in U.S.A, U.K., Europe and British Colonies. Honolulu, Hawaii - Kathy Muller Talent Agency. (808)-737-7917. 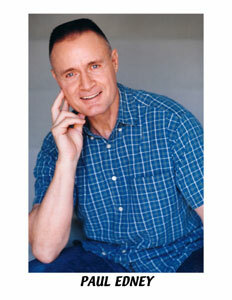 Las Vegas, Nevada - Best Agency (702)-889-2900. 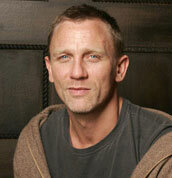 Paul Edney in ABC TV "Eyes"
Daniel Craig (above) is the new James Bond in the latest 007 movies. 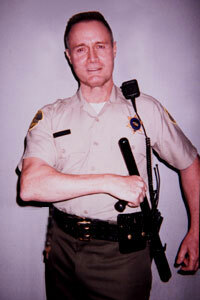 Also I believe I look similar to Robert Patrick. Do you think there is some similarity between us. Click here to give me your opinion. 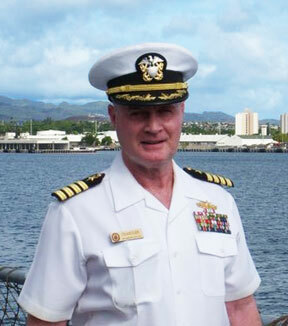 as a U.S. Navy Lieutenant. 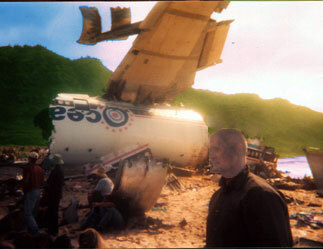 Paul Edney in "Fifty First Dates"
as a plane crash survivor. as a Courtroom Bailiff . Paul Edney dressed in his own genuine "Desert Digitals" - ready for those upcoming Iraqi War movies. Paul Edney in "Justified" as a Coal Miner. Paul Edney (right) in HERE! 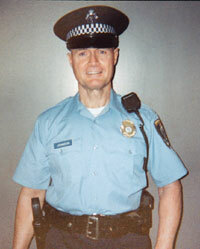 TV "Tides of War"
Paul Edney (as a cop) in NBC TV "Hawaii"
The series won 6 Emmy awards. CLICK HERE TO EMAIL ME .